The Career Center inspires and supports students to transition confidently beyond the GC Women University by creating a dynamic space to gain clarity through their process of self-discovery. The GC Women University, Sialkot Career Counseling Center supports the university’s commitment to provide high quality education to its students. The Center teaches undergraduate and graduate students how to develop educational and career goals, decision-making skills and job search strategies required to manage their professional and academic goals. GC Women University accomplish its mission by providing its students with expert advising, leadership in practical education, life planning skills and current information & resources about various opportunities. Graduates of GC Women University will have clarity of purpose and solid decision-making abilities. The students of the University are very confident, selective and competitive in managing their careers and further academic pursuits. Development of career is a lifelong process and Career Counseling can be appropriate for anyone, including fresh, juniors, seniors, and even the alumni. The earlier you started making decisions about your future, the better you will be prepared. As the GC Women University is newly established university and students of the university need extensive guidance in selection of their subject combinations which are best suited for the students according to the ability and aptitude of the students. Career Counseling Center is established with the aim to bridge this gap and provide the students the necessary training and guidance for the career selection. The Career Counseling Centre is established in GC Women University Sialkot on June 27, 2016 under the funding of Punjab Higher Education Commission, Lahore. The Punjab Higher Education Commission has released the amount of Rs. 4.0 million dated June 13, 2016 vide Cheque no. 619793. The purpose of this center has become quite holistic in the sense that they extend various training courses and student services ranging from psychological help to curriculum writing to preparation of business presentations on multimedia. This is very much good initiative of Punjab Higher Education Commission. The GC Women University, Sialkot is newly established university and it shows there is a dire need for the establishment of student counseling center. The role of career counseling and development is very essential now to instill better sense of selection of profession and path in students. Furthermore, this center can also be aligned with the objective to generate employability and marketable skills in students. For this purpose, the Punjab Higher Education Commission aims to establish the Career Counseling Centers (CCC) in public sector universities of the Punjab with a standardized criterion and clear role at institution level. An innovative and informative two days activity (27-07-2016 to 28-07-2016) titled “Open House Orientation Campaign for Admissions of Intermediate” funded by Punjab Higher Education Commission, Lahore was completed on July 28, 2016 under the leadership of worthy Vice Chancellor Prof. Dr. Farhat Saleemi , Government College Women University Sialkot. This two days campaign enormously helped the students trying to seek admission at GCWUS. Their queries were sufficiently and adequately answered by the faculty members who participated dynamically in it. This campaign served as a training of the faculty members to host upcoming Open House for undergraduate, graduate and postgraduate classes as well. The opening ceremony was held on July 27, 2016 at 11.30 am in the Auditorium of the University. 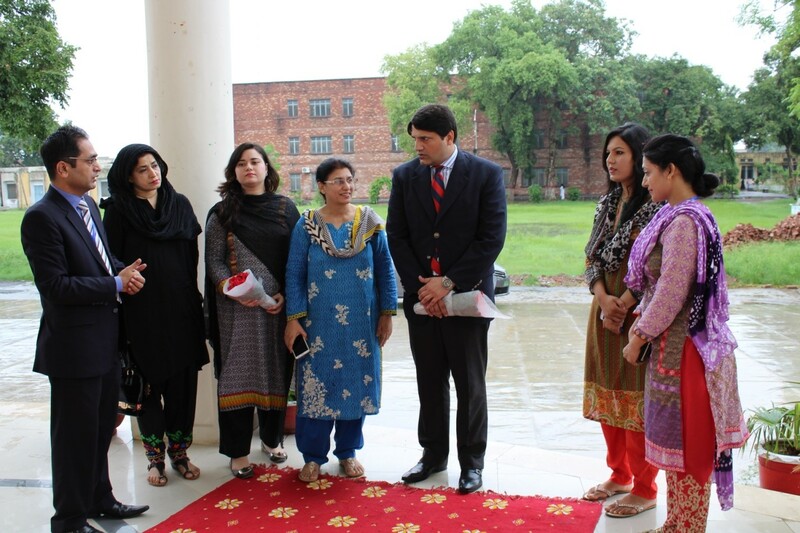 Mr. Asif Hussain, Manager CCC, Additional Director P&D / Coordinator (Trainings/Projects) and Ms. Rahat Batool, Deputy Manager CCC, GC Women University, Sialkot cordially welcomed the guests. 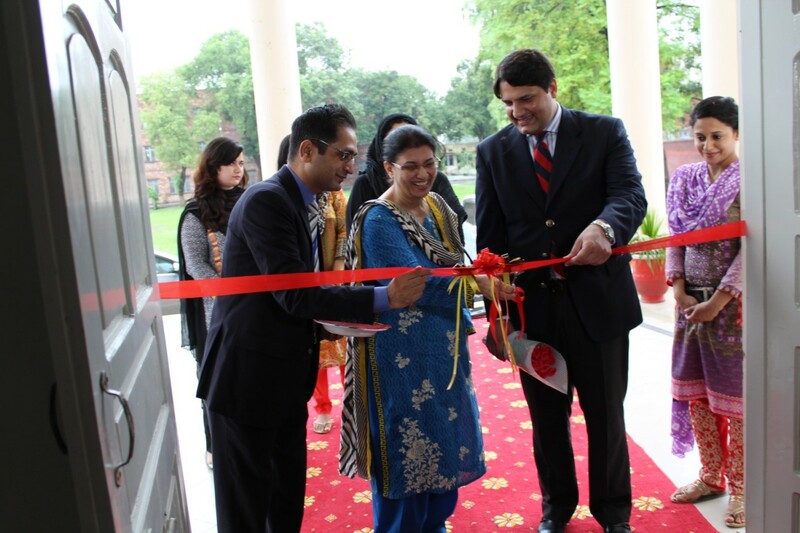 After the welcome remarks, the inaugural session commenced with the ribbon cutting ceremony by the esteemed Prof. Dr. Farhat Saleemi, Vice Chancellor, GC Women University, Sialkot as Chief Guest and Guest of Honor Mr. Khurram Jahanzeb, Chief Operating Officer, Punjab Higher Education Commission. 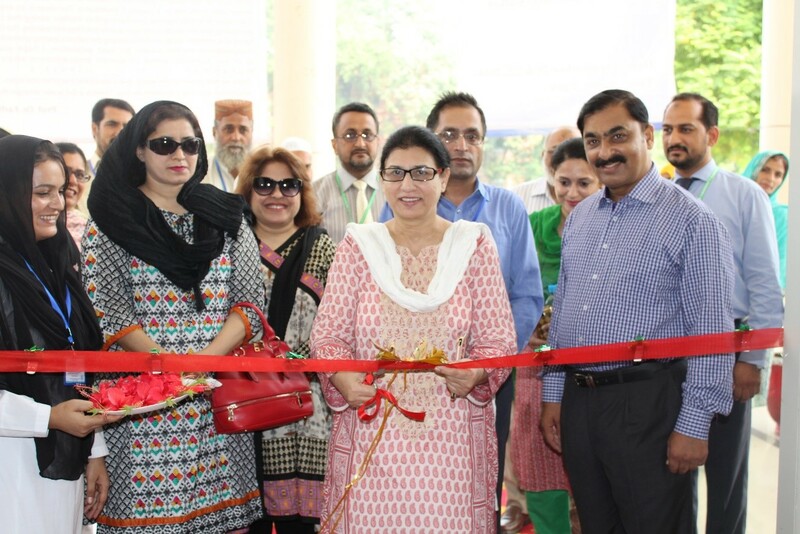 Prof. Dr. Haris Rashid Dean, Natural Sciences, Prof. Naila Arshad, Director QEC, Administrative Heads and HOD’s of various departments of GC Women University, Sialkot also honored the event with their presence. Develop a career path based on skills and interests of students. Select appropriate academic programs and other opportunities that maximize future educational and career options. Arrange education as well as job fairs to create industry-academia linkages. He also told them that with the above mentioned vision, Open House Campaign for Intermediate Admissions is the first activity scheduled by the newly formed Career Counseling Centre and many more such informative activities will be organized in future. 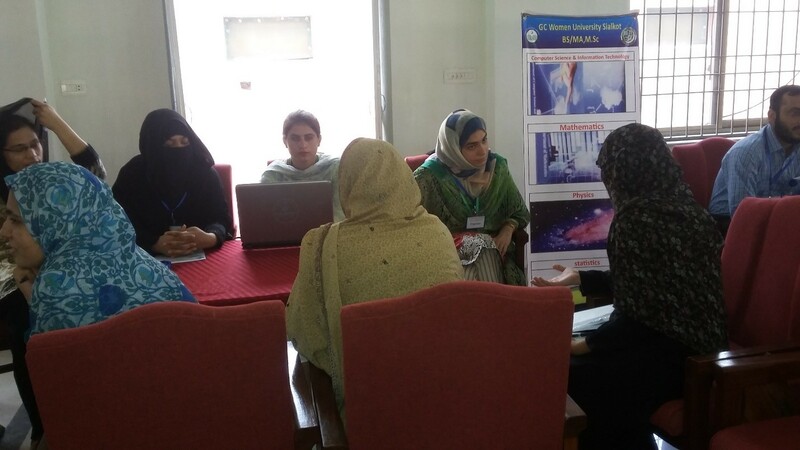 Then Ms. Rahat Batool, Deputy Manager CCC, briefed the guests about the organization plan of the program. She explained that all the subjects taught at Intermediate level had been categorized into six groups namely Pre-Medical, Pre-Engineering, ICS, General Science, Arts and I.COM respectively for the convenience of the students. At each stall there are two faculty members present as representatives of CCC in order to address the queries of students/parents regarding admission into various disciplines. Furthermore, they would also be guiding to their best, the students in choosing the appropriate career keeping in their mind, their merit, appetite and the scope of the chosen discipline. After that the guests were escorted to the stalls. Later Prof. Dr. Farhat Saleemi, worthy Vice Chancellor of GC Women University, Sialkot expressed her views in front of camera. She acknowledged the funds by the PHEC in establishment of CCC, saying it was a needed and necessary step. She extolled the whole activity especially the efforts made by the worthy Chairperson, Punjab Higher Education Commission and his team for provision of funds. The Guest of Honor Mr. Khurram Jahanzeb, Chief Operating Officer, Punjab Higher Education Commission took his chance to enlighten all present with his remarkable views on the need of the career counseling and funding of PHEC in establishment of CCC at GC Women University, Sialkot . He emphasized that the teachers should focus on character building of their pupils along with educating them. He highlighted the fact that the high literacy rate is not the only measure of a prospering society but how much morally groomed its citizens are, is equally important. The second day which was the last day of the campaign was an eventful day. Almost 33 inquiries were dealt to the satisfaction of the students/parents by the eager and passionate staff. The faculty members took their places at 9:30 am, after that people kept visiting from time to time. There were general inquiries regarding confusions in form filling to the specific ones regarding career counseling. Students who intended to opt Pre-Medical were more inquisitive, as highest trend of inquiries was witnessed at Pre-Medical stall. The usual question posed by the inquirers was about the merit. The second question which was repeatedly asked was the scope of the subject chosen and the third most frequently asked question especially at General Science and Arts group was about the particular subjects being offered in a particular group. 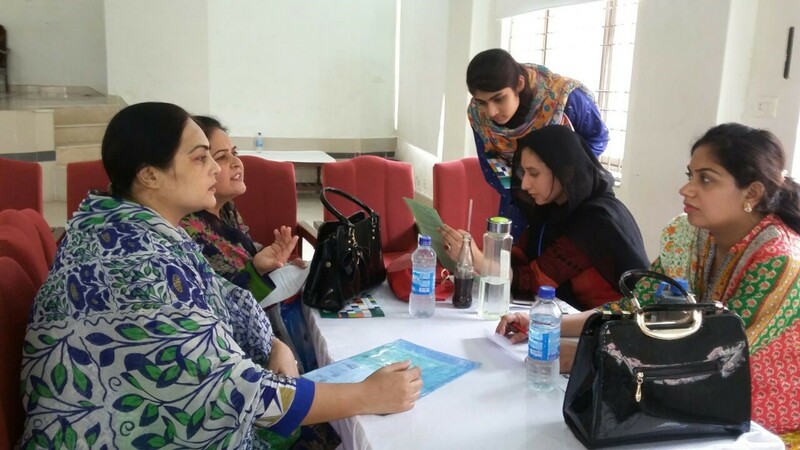 Others include the comparison between the methodology of teaching at Government and private institutions and why GC Women University Sialkot should be preferred. 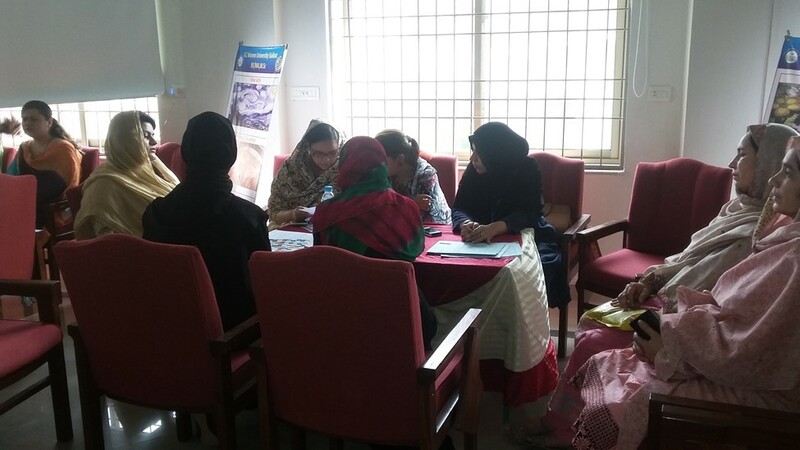 The dedicated faculty members addressed the queries efficiently and where needed Ms. Rahat Batool, Deputy Manager CCC took the inquiries herself and tried her best to satisfy the inquirers. The second and the last day was concluded at 1:30 pm. Ms. Rahat Batool, Deputy Manager CCC on the behalf of cherished Prof. Dr. Farhat Saleemi, worthy Vice Chancellor of GC Women University, Sialkot and Mr. Asif Hussain Manager (CCC) GC Women University Sialkot offered her heartfelt thanks and appreciated the assiduity of the dear colleagues and the efforts they have put in to achieve the desired goal together. 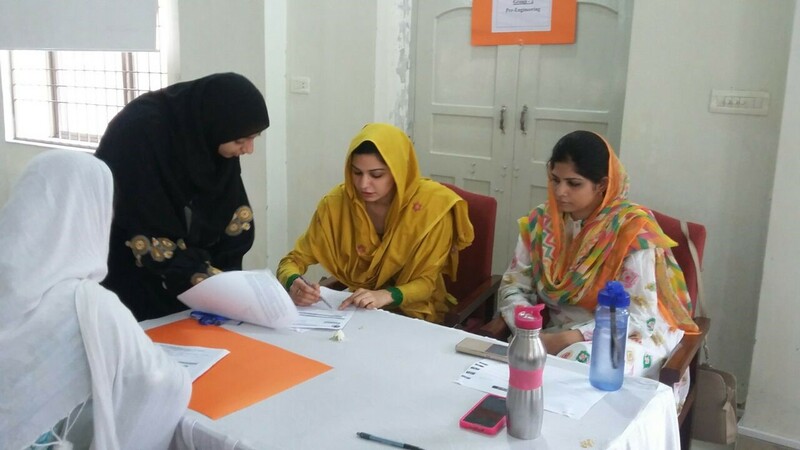 “Open House Orientation Campaign for Admissions of Intermediate”, was the first activity held under the umbrella of newly established Career Counseling Centre funded by Punjab Higher Education Commission at GC Women University Sialkot. The primary purpose of this activity was to do necessary rehearsal for the scheduled upcoming Open Houses for under graduate, graduate and post graduate students. Since the activity was the first of its type in Sialkot, people were well aware about the activity. The main objective was quite procured. People who came to seek guidance and counseling were well guided. Visitants evaluated it an innovative, informative, profoundly interesting and excellent activity. They found it quite helping and urged that these kind of constructive and enlightening activities should continue in future from the University’s platform. Career guidance and counseling is a comprehensive, developmental program to assist an individual’s competencies in self-knowledge, educational and occupational exploration, and career planning. In the current era of ever evolving knowledge and cutting edge technologies, it has become utterly important to taper the gulf between academia and industry. As most of the students are not aware of prevalent market trends, they need to be taught and trained to increase their competencies and marketable and employability skills during their stay at universities in alignment with the contemporary market demands. The proposed ‘Career Counseling Center’, will instill in them all the necessary skills and methods to increase their exposure to markets and corporate trends. For this purpose, the Punjab Higher Education Commission aims to establish the Career Counseling Centers (CCC) in public sector universities of the Punjab with a standardized criterion and clear role at institution level. The establishment of Career Counseling Centre at GCWUS in June, 2016 is one such step towards attainment of excellence. An innovative and informative two days activity (20-09-2016 & 22-09-2016) titled “Open House Orientation Campaign for Admissions of BS, M.Sc/MA, MS &PhD” funded by Punjab Higher Education Commission, Lahore was completed on September 22, 2016 under the leadership of worthy Vice Chancellor Prof. Dr. Farhat Saleemi, Government College Women University Sialkot. This two days campaign enormously helped the students trying to seek admission at GCWUS. Their queries were sufficiently and adequately answered by the faculty members who participated dynamically in it. This campaign rendered as a training of the faculty members to counsel and guide the prospective students. It was quite useful for the students intending to seek admission at GCWUS in a way that they learn how to pose queries that may be helpful in building their career path. The opening ceremony was held on September 20, 2016 at 10:00 am in the Auditorium of the University. 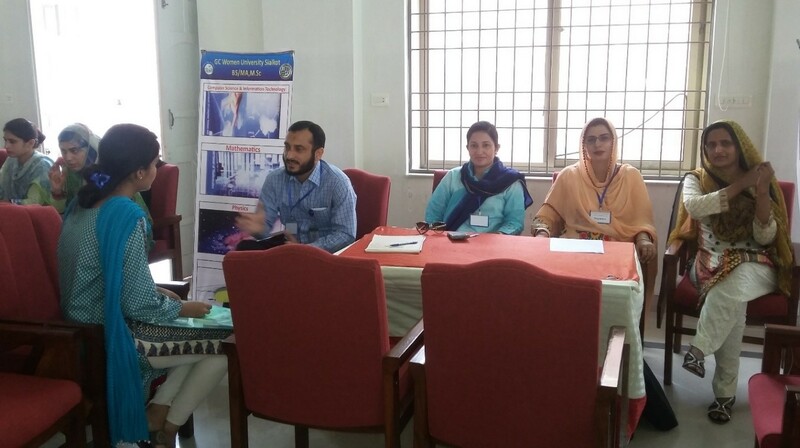 Mr. Asif Hussain, Manager CCC, Additional Director P&D / Coordinator (Trainings/Projects) and Ms. Rahat Batool, Deputy Manager CCC, GC Women University, Sialkot cordially welcomed the guests. After the welcome remarks, the inaugural session commenced with the ribbon cutting ceremony by the esteemedProf. Dr. Farhat Saleemi, Vice Chancellor, GC Women University, Sialkot as Chief Guest and Guest of Honor Mr. Shuaib Anwer Rana, Deputy Director of Colleges, Sialkot. 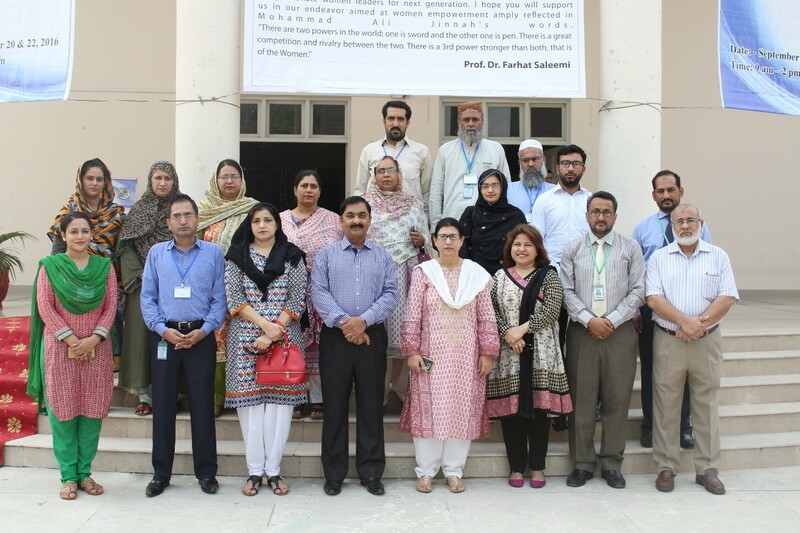 Prof. Dr. Haris Rashid, Dean Faculty of Natural Sciences, Prof. Naila Arshad, Director QEC, Dr. Zarrin Fatima Rizvi, Director ORIC, Administrative Heads and HOD’s of various departments of GC Women University, Sialkot also honored the event with their presence. He also told them that with the above mentioned vision,Open House Campaign for BS, M.Sc/MA, MS & PhD is the second activity scheduled by the newly formed Career Counseling Centre and many more such informative activities will be coming in row in future. Then Mr. Asif Hussain, Manager CCC, briefed the guests about the organization plan of the program. He explained that all the subjects being offered at graduate and postgraduate level had been categorized into seven groups. Five stalls out of seven have been reserved for BS inquiries while the other two were allocated regarding MS & PhD programs being offered. An additional stall would be exclusively reserved for the visitors. Three to four faculty members were nominated as representatives of CCC in order to address the queries of students/parents regarding admission into various disciplines at each stall. Faculty members have been guided to their best, the students in choosing the appropriate career keeping in their mind, their merit, appetite and the scope of the chosen discipline. After that the guests were escorted to the stalls. Later Prof. Dr. Farhat Saleemi, worthy Vice Chancellor of GC Women University, Sialkot appreciated the hard work of the organizers. She acknowledged the funds provided by the PHEC in establishment of CCC, saying it was a needed and necessary step. She showed her keen interest by visiting and posing interesting questions at each stall. It infused spirit among the faculty members who later carried out the whole activity with dedication and enthusiasm. Then the Guest of Honor Mr. Suhaib Anwer Rana, Deputy Director of Colleges, Sialkot took his chance to express his remarkable views. He mentioned that the establishment of Career Counseling Centre in varsity premises is the modern need of the hour. The second day which was the last day of the campaign was an eventful day. Almost 100 inquiries were dealt to the satisfaction of the students/parents by the eager and passionate staff. The faculty members took their places at 9:00 am, after that people kept visiting from time to time. There were general inquiries regarding confusions in form filling to the specific ones regarding career counseling. Students who intended to opt subjects at BS level were more inquisitive, as highest trend of inquiries was witnessed at BS stalls. The usual question posed by the inquirers was about the merit. The second question which was repeatedly asked was the scope of the subject chosen. 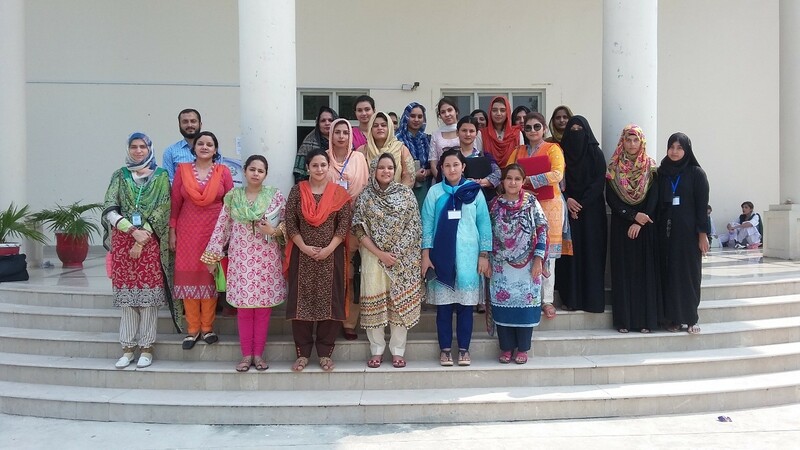 Others include the comparison between the methodology of teaching at Government and private institutions and why GC Women University Sialkot should be preferred. The dedicated faculty members addressed the queries efficiently and where needed. 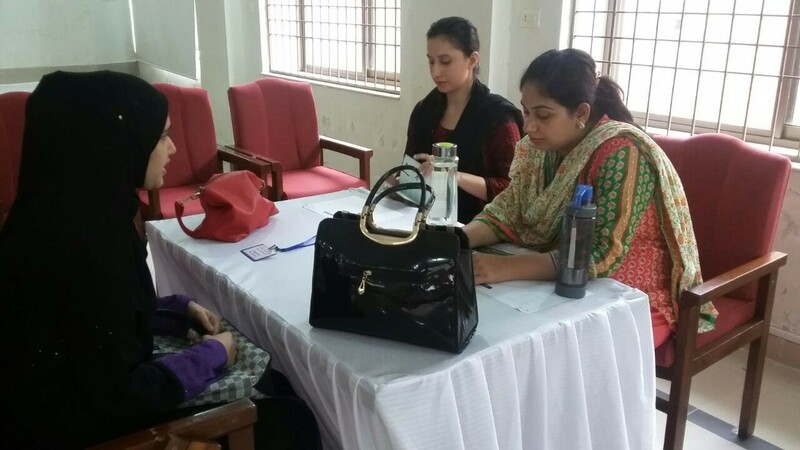 Ms. Rahat Batool, Deputy Manager CCC took the inquiries herself and tried her best to satisfy the inquirers. The second and the last day was concluded at 2:00 pm. Ms. Rahat Batool, Deputy Manager CCC on the behalf of cherished Prof. Dr. Farhat Saleemi , worthy Vice Chancellor of GC Women University, Sialkot and Mr. Asif Hussain Manager (CCC) GC Women University Sialkot offered her heartfelt thanks and appreciated the assiduity of the dear colleagues and the efforts they have put in to achieve the desired goal together. 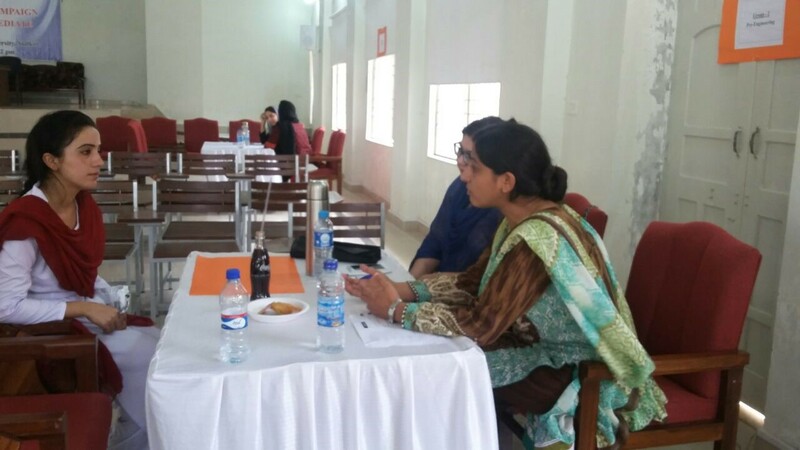 “Open House Orientation Campaign for Admissions of BS, M.SC/MA, MS & PhD”, was the second activity held under the umbrella of newly established Career Counseling Centre funded by Punjab Higher Education Commission at GC Women University Sialkot. The prime purpose of this activity was to assist under graduate, graduate and post graduate students in alignment to the appropriate career line. The quintessence of the event is to provide a conducive environment where prospective students can interact and ask freely the questions regarding their future educational plans and career. And the main objectives were quite procured. People who came to seek guidance and counseling were well guided. Visitants evaluated it an innovative, informative, profoundly interesting and excellent activity. They found it quite helping and urged that these kind of constructive and enlightening activities should continue in future from the University’s platform. The Career Counselling Centre, GC Women University, Sialkot conducted 2 seminars during the admissions of Intermediate, Undergraduate and Post Graduate under the visionary leadership of Prof. Dr. Farhat Saleemi, Vice Chancellor, GC Women University Sialkot. The 1st batch of BS Program of the University is going to pass out in November 2016. The GC Women University is planned following activities for BS and MS Students.